Rankin said aficionados loved Spark and during her life she was lauded by some of the greatest literary figures around. So why is she not better known and celebrated? ...Scotland has been bad in the past at recognising writers and artists who leave [emphasis the blogger's]. Many writers have had to leave to find themselves, to get a sense of themselves and to find their true vocation as a writer. How extraordinary then, to find a personal example of this Scotland trait in the same timeframe as the Rankin interview was recorded. It shrank the world to a state of companionship, and was a reminder of the ability of libraries to link their threads of knowledge to satisfy even the most unlikely queries. Researching an Italian family in New York led to an unexpected discovery. In the early 1930s, the Gaetano Belmonte / Carolina Nangano household, with eldest daughter Gesualda, took in a boarder named Roderick Robb Black. 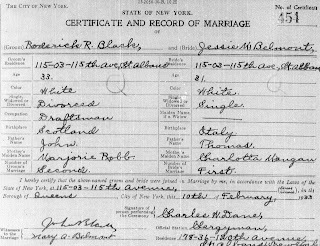 Roderick, like the Belmonte family, was a migrant; a Scot who had arrived in New York on The Astoria in June 1906 as a five year old boy with his mother Margaret and siblings to join their husband and father, John Black. [source: The National Archives, TNA_BT27_0486_00_0019_P_0004F]. 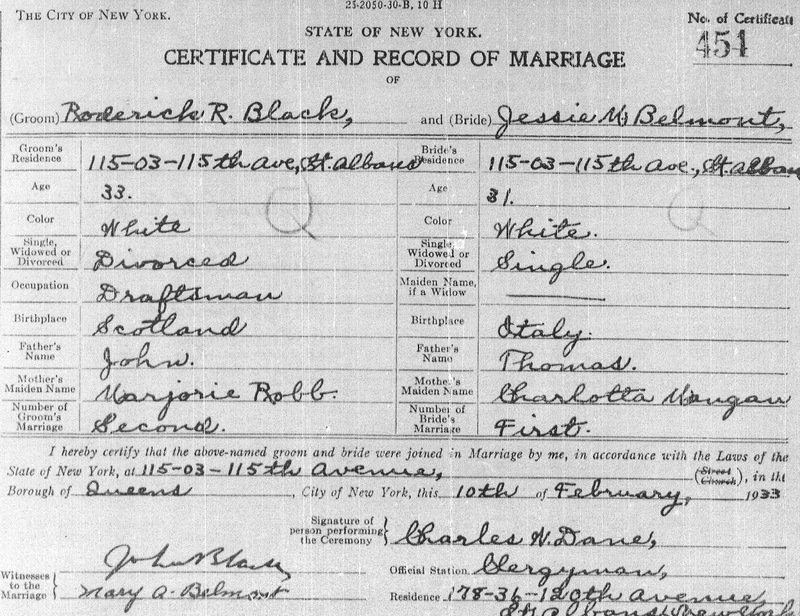 John Black died in 1910, nine years after arrival in New York from Scotland. He had left his young family of seven children twice - spending five years on his own in a different country - and at the end of a difficult life. He was 57 years old. By the time Roderick and Jessie (Gesualda) met, her parents were known as Thomas and Carlotta Belmont, and those of her siblings who were also Italian-born had anglicised their names. After his brief first-time marriage, Jessie became Roderick's second wife. Jessie's sister Mary and Roderick's brother John junior were witnesses. 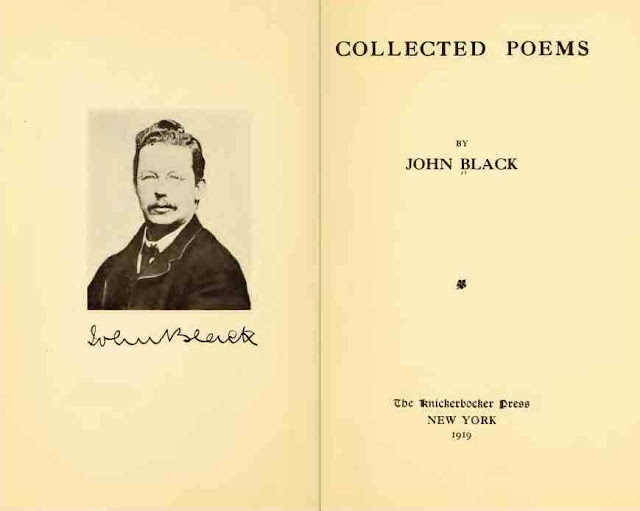 Both John Black senior and John Black junior were poets. The younger John was also the literary editor of The Brooklyn Daily Eagle and after several years of effort, he was eventually able to publish his father's Collected Poems. The National Library of Scotland did not know of his work, but almost 100 years after its publication, it was possible to find this poetry using a link provided by the National Library of Australia in Trove. The Library of Congress had made it available to the Open Library initiative for digitisation. This member of John Black's extended family gratefully used the virtual interconnections between libraries globally to track it down. John Black senior did not see his poetry published - other occupations were necessary during his lifetime to keep his family safe. He may be remembered more for his ownership of the Palace Hotel in his home town of Inverness during the 1890s, but the literary legacy of this disconnected Scottish son lives on in virtual imprint.